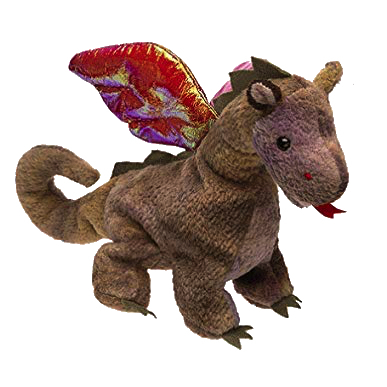 Scorch is a four-legged brown tie-dye dragon featuring curly napped fabric. A pair of large iridescent red wings sit on top of his back. Green felt spikes run along his spine and the same fabric is used for the claws on his feet. Scorch has black button eyes, red thread nostrils and a red felt tongue. Scorch was released 30th September 1998. He was the first Beanie Baby to use the curly, napped material. Scorch retired on 23rd December 1999.